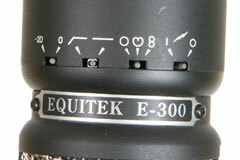 The Equitek E-300 is a large-diaphragm, multipattern solid-state condenser manufactured in Conneaut, OH by CAD in the late 1990s. It used a proprietary, center-terminated capsule that was imported from China. 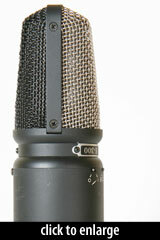 A later revision of this microphone, the E-350, used an “Optema” capsule built in CAD’s factory in Conneaut, OH. As part of the original Equitek product line, the E-300 was powered by a pair of internal rechargeable batteries, and used Op Amps in place of FETs within the amplifier circuit. Its output circuit was transformerless. Battery power on/off. The microphone’s internal batteries can be recharged via phantom power, but the actual power for the capsule is delivered by a pair of internal NiCad batteries. 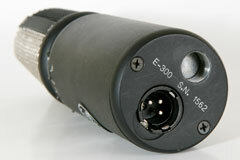 The Equitek E300 combines a vintage capsule design with advanced electronics. Typical FET (field effect transistor) condenser microphones use discrete designs. This means they use individual transistors that must be carefully matched for proper characteristics. Even with careful matching, discrete designs are inherently nonlinear. Equitek microphones use a different approach. We do not use any discrete FETs. 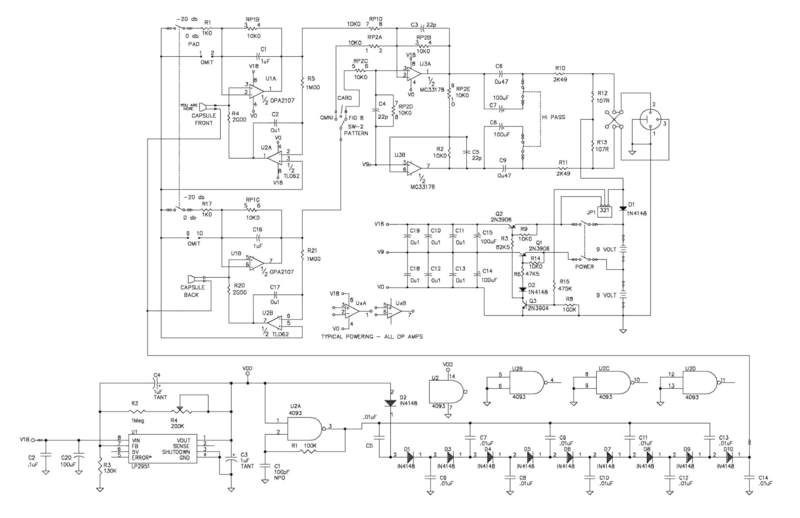 Instead, we use advanced high speed OpAmps (Operational Amplifiers). These OpAmps are individually laser trimmed for optimum performance and have very high gain. This allows a large amount of negative feedback to be used to significantly reduce any non-linearity. During transients, these OpAmps may require more current than typical phantom power supplies can deliver. The extra current demands are accommodated by our unique power supply design. Instead of using phantom power to operate the microphone, we use it to charge a pair of rechargeable NiCad batteries. This system creates a huge current reserve for the microphone’s electronics, yet there is no maintenance involved because the microphone automatically keeps the batteries charged during use. 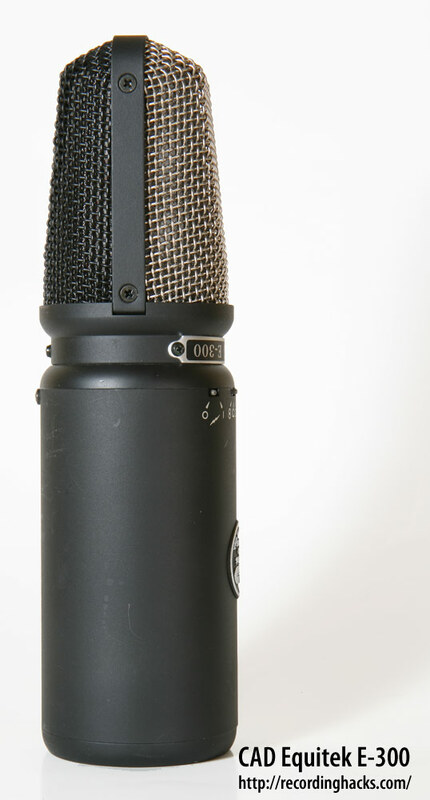 The use of OpAmps is not the only unique feature of Equitek microphones. For example, we also employ servo circuitry to minimize DC offset and eliminate interstage coupling capacitors. By late 2001, the E-300 had been replaced in CAD’s product line by the E-350, which was physically identical (aside from the badge). The E-300 shipped with a stand adapter (CAD p/n SM1) and an elastic shockmount (p/n ZM1), packed into a padded plastic storage case. It was quite superb on spoken voice, particularly when used very close, and once again, it was very hard to make the thing pop or bump! On dynamic acoustic guitar recordings, it came up trumps, being very accurate and detailed, and coping extremely well with the complexities of 12-string harmonics.